We’d love your help. 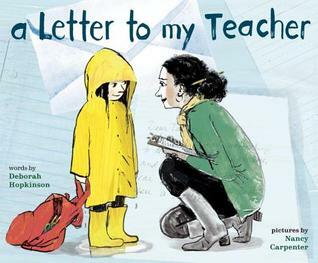 Let us know what’s wrong with this preview of A Letter to My Teacher by Deborah Hopkinson. To ask other readers questions about A Letter to My Teacher, please sign up. Exactly the kind of book you'd give to a retiring teacher to make her cry. 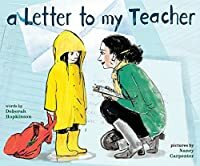 As a teacher, I found this book touching and very sweet, as it portrays the way we hope children feel about their teachers and how a teacher really can have an influence, even though they may not always know how far it reaches. I really liked how this story shows that you don't always know which experiences or small moments are going to be the ones that have the most meaning to a child. I do agree with other reviewers that this book is more for an adult audience than for children to read. Brought tears to my eyes. This is probably more for adults than kids though. Oh! Such a sweet story! I had tears in my eyes at the end. Give this to all of your teacher friends. Reminds me a lot of Thank You, Mr. Falker. A former student writes a letter of appreciation to a teacher. What a terrific story with great illustr A former student writes a letter of appreciation to a teacher. What a terrific story with great illustrations. Run and grab this book - then thank a teacher! Loved this! A terrific book about appreciating teachers for kids ! This book made me all weepy. It's the story of an exasperating grade two student and how her teacher changed the trajectory of her life. I loved it! It's definitely a great gift for the teachers that have been special in your child's life. A beautiful ode to all the good teachers. An inquisitive child highlights a teacher's patience, caring, and creativity in this lovely thank you note. This book made me remember some of the great teachers I've had and silently thank them, too. Definitely a sweet story and a great gift for any teacher. Definitely aimed more at an adult reader than a kid, but everyone who has ever worked with kids knows this kid well. As a teacher, I loved this book. It made me tear up even. It's not so much a children's book, but a gift for a special teacher. I received this as a gift from one of students as an end of year present, such a good story to remind me of the impact I have on these little people. Beautiful tribute to teachers everywhere. Loved this picture book! It is a very special book in the form of a letter written to the teacher by her student. I remember having inspiring teachers like this one and hope that everyone has a special teacher like this one. Highly recommended! Holy moly! I challenge anyone to read all the way through this one without tearing up. If you've ever been a teacher or parent, a slow learner, classroom-disrupter, or late bloomer, oh, what a book. A Letter to My Teacher is a letter from one such puddle-stomping, adventure-loving, exasperating student to her former teacher, detailing how much her teacher's patience, kindness, and skill meant to her. We all have choices every day - Hopkinson's perfect words and Carpenter's expressive paintings re Holy moly! I challenge anyone to read all the way through this one without tearing up. If you've ever been a teacher or parent, a slow learner, classroom-disrupter, or late bloomer, oh, what a book. I got some major goosebumps reading this one. I hope my students know how much I cared even when I was exasperated, too. Despite the first person child narrator, the tone of the book is very nostalgic, which makes sense when readers reach the end of the book and see the full-sized narrator with a classroom of her own. Ultimately more end-of-the-school-year-present for educators than picturebook. A sweet story about a child's favorite teacher, the memories, the patience, the dreams, and the woman she becomes. A Letter to My Teacher will surely resonate with every educator, young and old. Perhaps it was because I was a teacher for 35 years that I felt so touched by this book, but it is also because now I'm a children's author myself and Deborah Hopkinson did a beautiful job of choosing just the right words to make this a lovely read. Wonderful illustrations as well. I'd been meaning to read this and glad I actually took the time to finally do so. A sweet tribute to teachers told through the eyes of a second-grade girl who admittedly wasn't the easiest student to have. Very touching. This book is going to make a wonderful gift for teachers. Bit of a tear-jerker. A beautiful letter from a student (one who can't sit still) to her teacher (one who helps channel her energy). Give to the teachers in your life. For all the amazing teachers in the world that touch children's lives every day, this book is for you. It made me feel all the best feelings. For everyone who works in education. Never underestimate the lasting effects you have on a child. The pen & ink illustrations are beautifully rendered. With the small touches of bright color, the reader really feels how the student stands out. A lovely story. This picture book tells the story of a young 2nd grade girl who does not like school all that much. Its not that she isn't good at it, but she would rather run and play, and splash in puddles. However, her teacher comes up with creative ways for her students to enjoy the things they are learning about, such as using math to plan their very own garden. They plot the garden and make sure each plant has enough room to grow. This little girl continuously exhibits challenging behavior that would exhaust most teachers (which her teacher is at some points) but she gently helps steer her student in the appropriate direction to help improve her behavior and social skills. At the end of the book, the student is shown writing a letter to her 2nd grade teacher, thanking her for helping her enjoy school and learning not only math and science, but showing her patience and love as well. There are a lot of students in one general education classroom and teachers do not always have time to focus in completely on one student. They might try to as much as they possibly can, but it cannot always be accomplished. They can , however, always be patient an understanding in how they interact with students who might have behavior issues. Not embarrassing students, coming up with signals to remind students what they need to be doing, and spending the extra time they do have on getting feedback on how that students day was are simple ways teachers can always show they care. Summary: All teachers have the one student that would challenge them to the ends of the world and in this story there is one! The student knew the struggles and challenges she provided her teacher, so she decided to write a letter… In this letter the students explains how she loved to run, jump, and explore, but didn’t really like the listening and learning part of education. She explained how she couldn’t read, but was too frightened to tell her teacher; it didn’t matter the teacher knew. As th Summary: All teachers have the one student that would challenge them to the ends of the world and in this story there is one! The student knew the struggles and challenges she provided her teacher, so she decided to write a letter… In this letter the students explains how she loved to run, jump, and explore, but didn’t really like the listening and learning part of education. She explained how she couldn’t read, but was too frightened to tell her teacher; it didn’t matter the teacher knew. As this story goes on the student thanks her teacher for believing in her, challenging her to learn in the ways that she found engaging, and ultimately inspiring her to become a teacher herself. Evaluation: I absolutely loved Deborah Hopkinson’s book!! I believe that, as students, we all had that one teacher that challenged, encouraged, and inspired us the most. I remember challenging my 3rd grade teacher more than once, but she persevered, teaching and encouraging me to learn and practice my cursive writing. As a teacher, I have some challenging students in my class, but when I reflect on the progress of my students and how bright their futures are, it encourages me to keep them engaged and encouraged. I write picture books, nonfiction, and middle grade fiction. I love history and visiting schools to talk to young readers (Pre-K - 8 and sometimes high schools). My new books in 2019 are CARTER READS THE NEWSPAPER, HOW I BECAME a SPY, and WHERE IS THE KREMLIN? Recent awards for picture books include ORDINARY, EXTRAORDINARY JANE being named a 2019 Oregon Book Award finalist. I received the Jane Adda I write picture books, nonfiction, and middle grade fiction. I love history and visiting schools to talk to young readers (Pre-K - 8 and sometimes high schools). Recent awards for picture books include ORDINARY, EXTRAORDINARY JANE being named a 2019 Oregon Book Award finalist. I received the Jane Addams Peace Association Award for STEAMBOAT SCHOOL and the 2017 Green Earth Book Award and Santa Monica Public Library Green Prize for Sustainable Literature for FOLLOW THE MOON HOME. My nonfiction includes D-DAY: THE WORLD WAR II INVASION THAT CHANGED HISTORY, TITANIC: VOICES FROM THE DISASTER, a 2013 Sibert Honor Book and a 2013 YALSA Excellence in Nonfiction Finalist. COURAGE & DEFIANCE won the OCTE Spirit Award for Nonfiction and an Oregon Book Award. My historical fiction title, A BANDIT's TALE, was named a Charlotte Huck recommended book. THE GREAT TROUBLE, A MYSTERY OF LONDON, the BLUE DEATH and A BOY CALLED EEL, won an Oregon Spirit Award.